The research in the Bevan & Brown Lab involves the application of computational molecular modeling to relate the structure and dynamics of molecular systems to function. Systems currently under investigation include the amyloid β-peptide that is associated with Alzheimer's disease, peroxisome proliferator-activated receptor (PPAR) that is associated with inflammation, diabetes, and obesity, and sphingosine kinases for cancer drug discovery. Finally, we are using computational methods to design enzymes, with our strategy being to alter the substrate specificity of existing enzymes. We like to apply all kinds of best practices in molecular modeling to any kind of question - so if you have questions, please contact us through email or our Contact Us page. The specific mechanism of toxicity of amyloid beta (Aβ40 or Aβ42) in Alzheimer’s disease (AD) is not well-understood. Two principal theories of Aβ toxicity relevant to neuronal cell death center around the induction of proinflammatory and proapoptotic signals via cell-surface receptor activation or via direct cell membrane disruption. Preventing the accumulation and oligomerization of Aβ is a key potential therapeutic approach for AD and necessary for more biochemical understanding of the disease. We are pursuing three routes, using molecular dynamics (MD) simulations, to better understand the accumulation and oligomerization pathways of Aβ relevant to membrane environments. First, we are using MD simulations, incorporating four full length Aβ42 peptides separated by at least 3 nm, in cholesterol-rich raft model membrane to understand the effect of a membrane environment on the oligomerization of full-length Aβ42, to complement our recent work published in Biophysical Journal. Second, MD simulations are being used to show the formation and structure of n-mer Aβ-42 systems, from dimer to dodecamer, and are expected to demonstrate a gradual shift from beta- barrel-type structures in low n-mer systems to fibrillic or prefibrillic forms in the higher n-mer systems. Third, we are using steered MD to assess the stability of an cylindrical tetramer, formed in previous 1-us simulations, to pull a peptide unit from the oligomer to assess free energy required to disrupt this unit. This approach provides a transitional link between the insoluble fibrillic forms of Aβ and the soluble oligomers and may provide insight into the relative toxicity of Aβ oligomeric species and the contribution of their membrane- and lipid-raft mediated toxicity to the overall cytotoxicity of Aβ. We look to expand our work in this area by better understanding larger low-molecular weight oligomer formation and interaction with receptors, building complex membrane environments to assess other factors, and looking into the role small molecules might play in attenuating some of these membrane disrupting events. The number of Americans with chronic inflammation-related diseases, including diabetes and obesity, rises significantly each year. The therapeutics used to treat type 2 diabetes, thiazolidinediones (TZDs), often exacerbate the problem by causing side effects, like edema and heart complications. In an attempt to discover more effective and less harmful treatments, our group is working on a combined computational and experimental approach for finding PPARγ, PPARδ, and PPARα agonists. PPARs are in the nuclear receptor family, and transcription is activated and mediated by ligand binding. The molecular composition of the ligand dictates conformational changes that lead to activation of the protein and coactivator recruitment for regulation of genes. Specifically, PPARγ is a key drug target for the regulation of Type II Diabetes and inflammatory diseases due to its role in mediating the levels of glucose and controlling inflammation levels around the body. We are using MD to assess the apo, active, inactive, unbound, and bound structures of PPARγ and the role ligands play in altering the conformational state of PPARγ. Particular interest is in the oscillation of helix 12 (H12), residue fluctuation, and secondary structure composition. The outcome will be a compilation of protein-ligand interactions required for transition of each structure type an active form. This information would benefit drug discovery and design efforts to find alternative treatments for chronic inflammatory disorders. Alterations in or disruption of cell proliferation and cell signaling pathways are significant given their connection to multiple disease states including cancers and fibrosis. In our current research we focus on two sphingosine kinase isoforms, sphingosine kinase 1 (SphK1) and sphingosine kinase 2 (SphK2). These enzymes catalyze the synthesis of a signaling molecule, sphingosine-1-phosphate (S1P), and they are involved in cell differentiation and have been found elevated levels in certain cancer cells. This connection has led to an increased focus for more potent inhibitors that are selective for SphK1 or SphK2. Mouse SphKs produce different levels of S1P under certain conditions compared to human SphKs, so it is necessary to determine the structural properties that may result in different S1P expression levels. In collaboration with the Santos Lab in the Chemistry Department at VT we have produced homology models of mouse SphK1 and SphK2, performed molecular docking to identify isoform-specific inhibitors, and analyzed key interactions between the inhibitors and the enzymes in the binding pocket. We also are analyzing binding site volume to compare the four enzymes and elucidate differences based on sequence variation in the binding cavity. This study has the potential to aid in SphK inhibitor design and inform in vivo studies involving mice by highlighting structural distinctions and identifying the role of key residues that cause observable, functional differences in isoforms and species. We also seek to explore more in silico methods (QSAR, COMFA) to best determine key physicochemical properties for isoform specific inhibitors. Intrinsically disordered proteins (IDPs) lack stable tertiary and/or secondary structure under physiological conditions and are often implicated in disease states (Alzheimer's disease, Type 2 Diabetes, Parkinson’s, etc), through the assembly of proteins into oligomeric aggregates. The details of this self- and hetero-assembly and the effects of these oligomers, especially low molecular weight oligomers (dimers to dodecamers), on plasma membranes is largely unknown. By investigating the molecular details, mutations, and interactions associated with oligomer assembly and the interactions of the oligomers with membranes, we can provide insight into mechanistic details relevant to toxicity and disease states. In this work, we seek to use in silico techniques to characterize folding/unfolding of IDPs, including amyloid beta and islet amyloid polypeptide, both separately and in heterogeneous systems (combining multiple IDPs together). We also seek to assess potential efficacy of small molecules to attenuate their oligomerization that leads to fibril formation. Type 2 diabetes mellitus (T2D) is a complex metabolic disorder drastically increasing in prevalence worldwide. A characteristic feature of T2D is the deposition of islet amyloid polypeptide (IAPP), an intrinsically disordered protein (IDP), in the pancreatic islets of Langerhans, which leads to β-cell dysfunction and death.. Interestingly, the rat (Rattus norvegicus) form of IAPP (rIAPP) does not exhibit the toxicity that is observed with the human form (hIAPP). We seek to understand how peptide structure, the presence of flavonoids, and membrane environments influence the folding and aggregation of this protein, which are related to its toxicity. We are using molecular dynamics (MD) simulations to study the influence of primary sequence on secondary and tertiary structures of hIAPP and rIAPP in solution and in the presence of three model membranes. In studies with flavonoids, we use MD to simulate the aggregation of peptide residues 10-20 and 20-29 and examine the efficacy of selected flavonoids on attenuating trimer formation. Computational tools and techniques are attractive due to the low-cost and scope of application and are becoming more prevalent and accepted across a variety of fields. 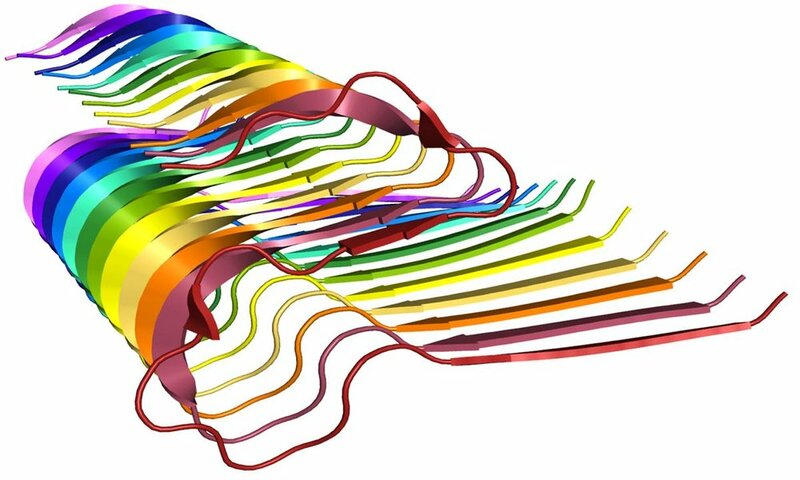 With the advancement of high performance computing resources and the recent utility of GPU architecture, molecular dynamics (MD) simulations have become a nearly ubiquitous tool to interrogate protein structure-function relationships. Understanding these structure-function relationships is fundamental to protein biochemistry and facilitates avenues to modulate activity in disease. Herein, we study and compare the ability of several GPU- and CPU-based clusters to accelerate mechanistic and therapeutic discovery with MD simulations. MD simulations on the peanut protein Ara h 2, the causative agent of allergenicity, from 10 different peanut species of the genus Arachis were conducted in triplicate out to 800 ns to probe epitope solvent accessibility relevant to allergenicity. These simulations provide molecular insight into the causes and potency of the allergenic response. Ultimately, these computational findings and insights can be translated to experimental labs, increasing the impact of the work, understanding of disease states, and guiding therapeutic design. Further, integrating GPUs into these parallel computing operations accelerates computations and provides researchers with tools to perform MD simulations without large CPU centers. We have thus provided an increased understanding of protein structure-function relationships through the usage of high performance computing and have shown GPU scaling power with MD simulations. The objective of this work is to propose function to radical S-adenosyl-L-methionine proteins that have no annotated or predicted function in Methanocaldococcus jannaschii and other Archaeal organisms. The major function of this work is to generate bioinformatic protocols using publicly available databases and software to propose a function to these proteins. Following prediction of function, the proteins will be experimentally tested to validate the predictions made using the developed methodology. We are also doing cross-genome comparisons of proteins in order to elucidate methanogens that have different metabolic pathways and different homologues. We will perform all analyses using open-source bioinformatics programs and assess each for their prediction of protein function for given protein sequences. To further our understanding of radical SAM enzymes, we are also looking at their percent composition in the proteome as a means for detecting protein homologues and aiding in prediction assessment. We have recently initiated a collaborative project with Dr. Ryan Senger of the Department of Biological Systems Engineering. Dr. Senger has developed an approach to identify metabolic pathways that may lead to the production of novel biofuels and other chemical intermediates using bacterial systems. These systems have the potential to be very specific for the products they produce and are environmentally friendly. One of the challenges is that the enzymes that are involved in these pathways may have low activity towards the substrates on which they need to act. We are applying molecular modeling approaches to model structures of the enzymes, examine their dynamics, dock potential substrates, and predict changes in the enzyme that may improve activity towards the substrates. - Organizing and hosting the Health Analytics Symposium on January 18, 2018. Click for news story. - Designing and teaching the spring 2018 undergraduate honors course Medicare for all: Health Care, Data Ethics, and Social Equity. In this course, we will explore equal access to health care through the Medicare system as an example of how informatics is employed to assess health outcomes. The studio will focus on collaborative research to evaluate the Medicare system within the United State. Over the course of the semester, we will explore and evaluate how data is used in various sectors, the types of decisions that are made using data, and what the future holds for data science. - Performing a needs assessment to 1) unite current educational and research efforts concerning health analytics from Virginia Tech academic departments that currently operate independently; 2) empower current and future students to solve health analytics problems; 3) fill the current gap in research by studying, developing, and fostering health analytics in an academic setting. By evaluating Virginia Tech's current education and research efforts surrounding health analytics, HAT will be equipped to plan the best next steps to educate students, assist faculty, and unite health analytics efforts across campus. - Assisting in designing graphics and multimedia content for the 2018 Public Health Week campaign for Virginia Tech Department of Population Sciences and the Virginia Department of Health.